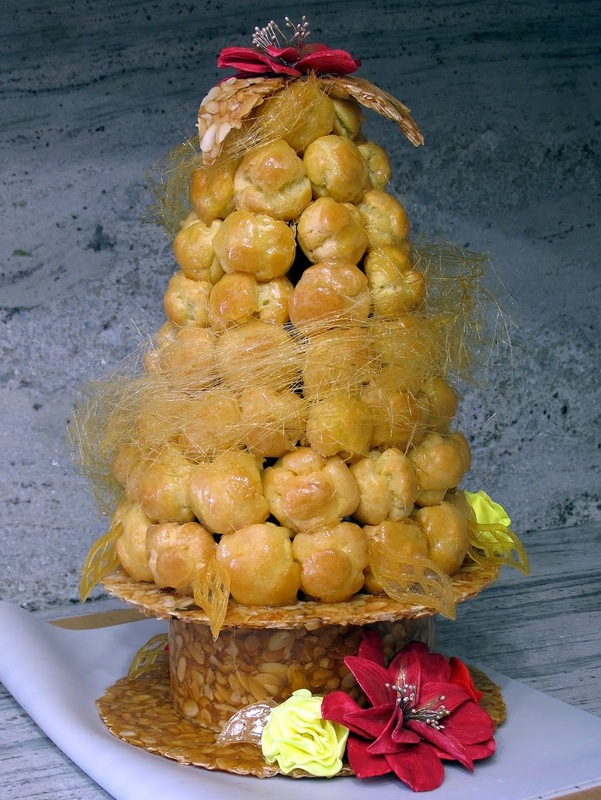 A croquembouche is a traditional French dessert found at celebrations such as weddings. The name of the dessert comes from the French words, croque en bouche, meaning ‘crunch in the mouth’. 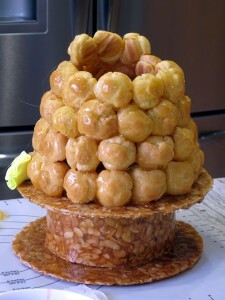 The dessert is basically a conical tower of profiteroles (choux pastry filled with pastry cream or crème légère), held together by caramel. 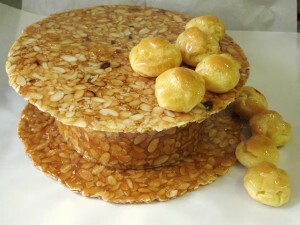 A traditional base for the presentation is nougatine (caramel and sliced almonds), and decorations can include caramel, sprinkles, ganache, flowers, and more. 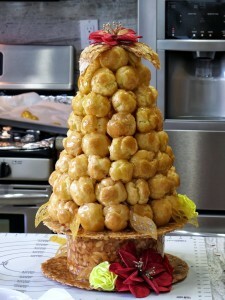 When my friend Stephanie saw the photo of a croquembouche we made in class, she asked if I would make one for her wedding in April. I was honored, but intimidated! After some careful planning and a little bit of practice, I’m happy to share some photos of what I hope was a generally successful attempt. 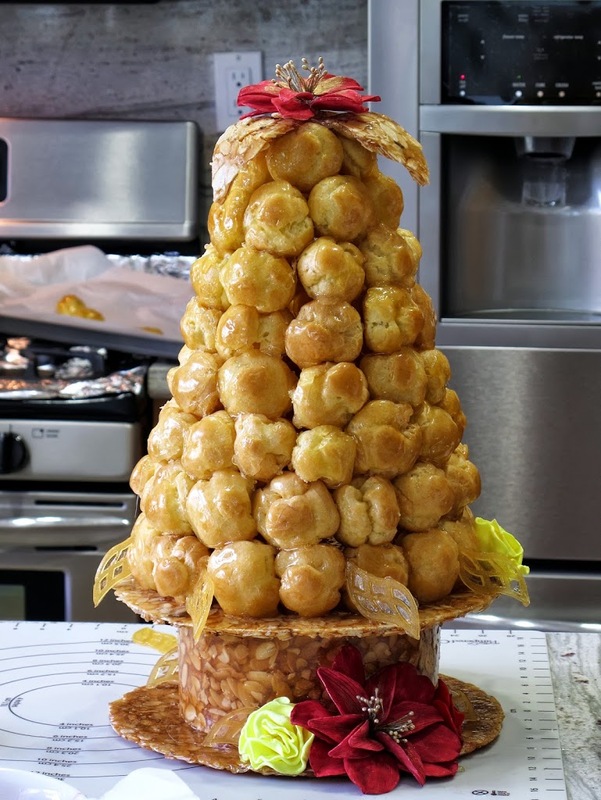 My only regret is that I made this purely for decorative purposes (in part because I don’t have a commercial kitchen and in part because I had to do a red-eye drive to transport the components from NorCal to SoCal) and thus only filled the bottom two rows of cream puffs. Had I known there would be so much interest in actually eating this, and had I known that caramelized isomalt would hold up so effectively and not soften like caramelized granulated sugar often does, I might have been brave enough to fill every cream puff. The base was the most challenging piece. After nougatine is cooked and poured, you literally have a matter of seconds or minutes to cut and shape (less when using isomalt as in my case). Once it hardens, it would have to be reheated in the oven to soften enough for molding. And unfortunately, the standard home oven is not large enough for a full sheet pan or the length of nougatine that is necessary to form the ring. Fortunately I stocked up on isomalt and almonds and got this right after a couple attempts. 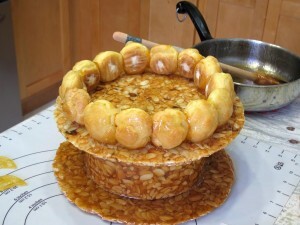 I also used nougatine for the decoration on top. 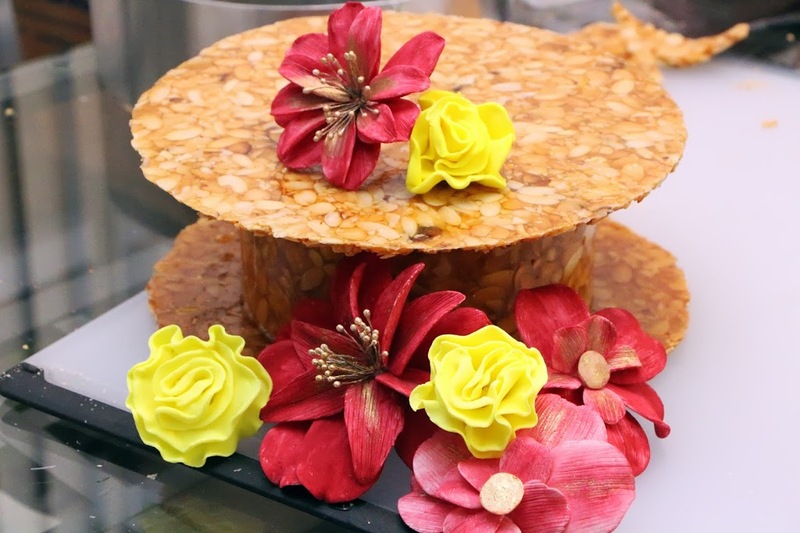 The flowers are a mix of hand-painted (but pre-made, store-bought) gumpaste flowers, and hand-made fondant-gumpaste roses and carnations. The color scheme for the wedding was pomegranate, citron and gold, which I think I captured in these flowers. I hope to learn how to make the wired gumpaste flowers from scratch in the near future, but given the limited time I had, these ones from Michael’s worked well. Isomalt does caramelize but does not darken in color as much as granulated sugar does. I liked the lighter, clearer color for coating the cream puffs and gluing the pieces together, as you can worry less about drips and uniformity (just don’t eat too much of it). Isomalt is also more stable in that it absorbs less moisture and is less likely to get sticky and “melt” when sitting out. Adding a small amount of granulated sugar provides color (and control over the color). For the spun sugar, I used a greater amount of granulated sugar to get a more golden color. This was a beast to make, but I am so glad I took on the challenge and was thrilled to share in the celebration of a beautiful young couple.